On Thursday the 14th of March and Thursday the 21st of March two masterclasses on networks and their applications will be organized by the NETWORKS program. Each one-day event is intended for secondary education students (VWO 5 or VWO 6) and teachers. It is a one-day event given in two different locations, Eindhoven and Leiden. The aim of the event is to introduce secondary school students with an interest in mathematics to mathematics education at a university and to provide them further deepening in their mathematical knowledge. If you would like to attend the masterclass (teacher or student) please fill in the registration form (registration is closed). Participation is free of charge. Please submit your registration form before the 1st of March. This year we will organise two identical one-day masterclasses. The first one will be held on the 14th of March at the Eindhoven University of Technology and the second one on the 21st of March at Leiden University. The programme will consist of lectures, discussions, games, reading sessions and interactive group activities. 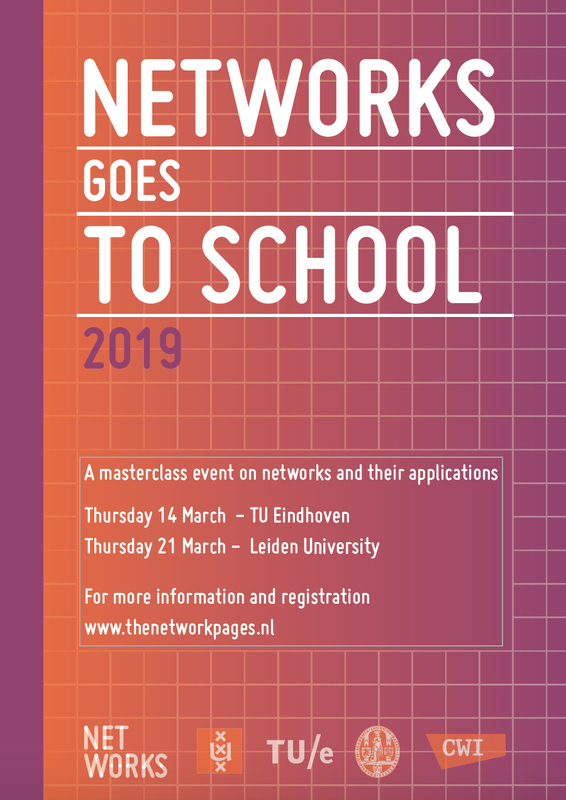 The speakers for NETWORKS goes to school 2019 are Mark van der Boor (TU/E) and Margriet Oomen (Leiden). 15.45 - 16.30 Discussion, questions, feedback and group photo! All the material will be gathered in a self-contained booklet which can be used after the masterclass by teachers in the classroom or by students who want to have a glimpse into networks science! The booklet from last year can be downloaded here. The first masterclass "NETWORKS goes to school" was organised last year and it was a big success. It was the first masterclass on the mathematics of networks held in English and hence suitable for international schools as well! The NETWORKS program started in the Summer of 2014 and covers a broad range of topics dealing with stochastic and algorithmic aspects of networks. The aim of the programme is to address the pressing challenges posed by large-scale networks with the help of stochastics and algorithmics. The focus is on modelling, understanding, controlling and optimizing networks that are complex and highly volatile.